"America is never wholly herself unless she is engaged in high moral principle... My Friends, we have work to do. There are the homeless, lost and roaming. There are the children who have nothing, no love, no normalcy. There are those who cannot free themselves of enslavement to whatever-drugs, welfare and the demoralization that rules the slums... The old solution, the old way, was to think that public money alone could end these problems. But we have learned that this is not so. And in any case, our funds are low. We have a deficit to bring down. We have more will than wallet; but will is what we need." -George Bush, Inaugural Address, Friday, January 20, 1989. From our current vantage point, the lack of obfuscation in this speech is notable and one could hardly imagine a more recent president or press secretary speak with this amount of candor. Couched in between the inspirational phrases, the facts are made plain. We aren't going to spend money on certain social services anymore. This was the basic truth behind George Bush's poetic call for the "thousand points of light", a massive government retreat from social investment dressed up in a rhetorical appeal to its citizens good nature and initiative to pick up the slack. However, those thousand points of light are not just the heating bulbs at the church bakesale or the porchlight at the local soup kitchen. Points of light might also include torches, fuses and bonfires, and the lack of specificity for just what sort of light was called for was an interesting slip; for the administration and the speechwriters and the policy-makers forgot the simple fact that when one no longer offers something, then one relinquishes some control. The Government's retreat from serving as a partner in social welfare opened up the field to people with very different ideas about what is worth doing in the world. Where the government retreats, local, provisional solutions become manifest through voluntary association and shared values. You don't have to look farther for evidence than private initiatives such as the various cannabis buyers clubs, where low cost marijuana is sold to those with debilitating illnesses. These efforts to put a "kinder face" on people's suffering have been constantly harrassed by the federal government in the same way as the Sanctuary Movement churches were persecuted for harboring Latin American political refugees fleeing tyrannies supported by our national policy. One government's illegal action is another private citizen's moral obligation. It is here that the conception of this exhibition begins, and its underlying idea extends from the poetic conceit of its title. The shadow cabinet is an instrument used by parties that are not in power to model alternatives to the current ruling government. Though actually powerless, shadow cabinets create a vision of what might happen if the tables were somehow turned. They are a glimpse of the might-have-been and the perhaps. Since shadow cabinets essentially work through the creation of metaphoric and symbolic alternatives rather than real political power, they seem an apt location for artistic overlay and occupation. While the title extends from a poetic thought, the idea for the exhibition arises from an observation of current tendencies in the art worlds. There has been a distinct rise of artist-initiated projects which have at their core a structure of dispersal, one that seeks to connect audiences to useful goods and services. It is interesting that this has occurred roughly over the same period of time that our national government has abandoned somewhat similar projects and responsibilities. I heard about the artists groups in this exhibition in a piecemeal fashion, either because I knew them personally, or had become aware of them from link sites on the internet and through word of mouth. 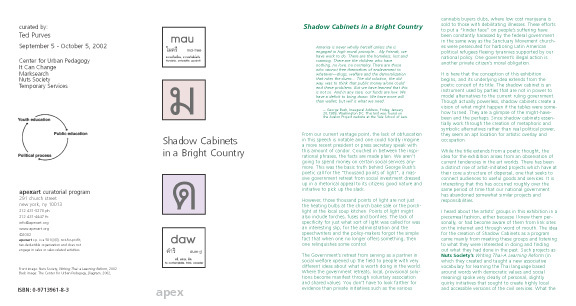 The idea for the creation of Shadow Cabinets as a program came mainly from meeting these groups and listening to what they were interested in doing and finding out what they had done in the past. Such projects as Nuts Society's Writing Thai-A Learning Reform (in which they created and taught a new associative vocabulary for learning the Thai language based around words with democratic values and social meaning) spoke very clearly of personal, slightly quirky initiatives that sought to create highly local and accessible versions of the civil services. What the groups had in common was a sense of personal commitment and a desire to make art in the public sphere that was not circumscribed as "public art". I have instead asked the artists to present their own descriptions of the projects they are undertaking for the Shadow Cabinets exhibition. These statements are printed in this brochure and contain not just plans for action but the backbone of those decisions as well. It is worth remembering that artists' are not always precise public activists and are generally not seeking to become full time social workers; their engagements wander more towards the symbolic and the fugitive. It is probably not coincidental that the physical forms for their projects borrow from existing government structures and materials. There are echoes of educational planning, census forms, government pamphlets, public hearings, even the stickers one receives after voting. Taken together, they create a divergent vision of what governments by the people might be. But as much as their projects draw upon governments for their visual form and institutional structure, their movement and the undertakings of the work have more in common with the structure of voluntary associations. The dialogue occurs between individuals and exchanges happen locally. At a larger level, it is here that these projects speak about more than just political and social ideas, and have implications beyond that of shadow cabinets and alternative governments. They also become examples for the larger idea of art in the world. The idea of art in the world has been with me for sometime, but throughout the planning of this exhibition, I have been dwelling on it. And yet I am still not sure exactly what it is. The phrase arose out of observation and dialogue, rather than art magazines. If there is such a thing as art in the world, it would certainly trace its parentage back the experiments in performance and conceptual art that sought to create an art-life fusion. Yet it separates from these prior movements by not being interested in the "blurring" of the two worlds as an endpoint or a priority. These projects in the exhibition do not hide the fact that they are conceived as art, nor do they attempt to blend in with daily life, only known as artworks by those "in the loop". They want to connect to people, to offer them goods, services, information, a leg up or a helping hand, and they want to do this in the world where people live as well as in the galleries they visit. At the time of this writing, the projects are only just beginning. They will unfold as the exhibition does, actively, through public engagements and shared ideas, as well as through exercise classes, free food in SoHo and a public symposium on New York's garbage policy. Our challenge is to engage with them as fellow citizens rather than gallery viewers, to risk involvement through participation, assistance and debate. Communicating and connecting new thinking to the society/world are some of Nuts Society goals. Writing Thai : A Learning Reform project is another such art concept/project that attempts to facilitate/cultivate good values and morals through a new learning activity. A basic and traditional Thai alphabet exercise book has been readapted into two formats (poster and instructional cd-rom). The various letters of the Thai alphabet are each linked to specific words, with the underlying intent of creating lifelong associations between letters and concepts which are activated in the daily process of writing. Nuts Society will also offer weekly sessions of the Nuts Society Aerobic Center in conjunction with the Learning Reform. In these lessons, participants will learn the Thai language while being guided through a series of interpretive exercises by and instructor and a projected video. These exercise classes will be held in the gallery. The Aerobic Center is designed to combine the socially-constructive language instruction with physical exertion for a well-rounded experience. To learn more about Nuts Society, visit their website. How is garbage political? Garbage is not a thing; it is a system. Our goal is to find the social in this system, and then work to create a new sociality of garbage. 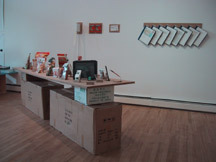 Garbage Problems is a prototype educational exhibit. It is intended to produce social experiences that assist residents in governing their infrastructure. CUP will present a symposium on Garbage Problems at apexart on Tuesday, October 1st, 2002, 6:30 - 9 pm. In a CUP Classroom, CUP works with students on inquiry-based projects. Projects consist of research around an issue (interviews, site visits, and media work) and then the creation of educational events (exhibits, film screenings, panel discussions, and publications). Playing the catachrestic role of the Public, students and staffpeople develop their skills of democratic participation, and then use what they learn to help others participate more fully. Ideally, it is a self-perpetuating cycle. The Center for Urban Pedagogy (CUP) is a nonprofit organization dedicated to producing educational projects about the built environment and social decision-making. 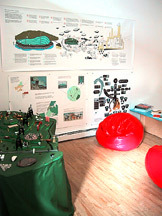 Since 1995, CUP has organized and produced exhibitions, publications, discussions, and educational programs on topics such as Governors Island, building codes, street trees, the African Burial Ground, urban development, and architectural education. Ongoing projects address risk management, business improvement districts, international financial institutions, and land reform. Learn more or get involved at www.anothercupdevelopment.org. "The first U.S. marking statute was enacted in 1890. The basic requirement, which has been in effect for more than one hundred years, is that virtually all imported products (or their containers) must be marked with a foreign country of origin. One purpose of the marking statute is to inform consumers; the statute also operates to 'protect' domestic producers." "Transnational corporations now roam the world to find the cheapest and most vulnerable workers. The people who stitch together our jeans or assemble our walk-mans are mostly young women in China working 15 hour days for pennies an hour." The WHO MADE THIS IN CHINA ? project, developed by Marksearch, is a survey about the array of products made in China available for American consumption. While this survey is targeted at the Tribeca region of Manhattan, it could be a useful survey for towns and cities across the US: few products on the shelves of American stores are locally produced. Survey recipients are invited to answer several questions about the products made in China that they typically purchase. The recipients are also asked to participate in an action to increase American consumers' awareness of the producers of these products. Each postcard survey comes with a gold label that asks WHO MADE THIS IN CHINA? ; the survey recipient is requested to adhere this label to the product made in China that would usually be purchased. The completed surveys will be collected apexart. After all of the surveys have been received, Marksearch will analyze the data and produce a report. Marksearch, an independent research team formed in 1995, is dedicated to the exploration of social issues affecting people's relationship with urban spaces. National and international research projects have addressed the definitions of city centers and landmarks, post-communist urban transformation and local community history. For further information about this project and other Marksearch projects, please contact marksearch@earthlink.net. Ten posters. 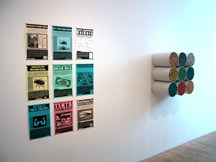 The posters were adapted from an experimental exhibition strategies text we were developing a couple of years ago. We have modified them to address a wider, non-art audience and to suggest ways that people can creatively reconfigure public spaces to a variety of ends. The posters will be made available in Apex. They will be presented in several public locations using a strategy outlined in one of the posters. The name Temporary Services reflects a decision to present art as a service to others. Our approach is non-commercial. We use our training as artists and writers as a point of departure for creating interesting social contexts and experiences. When we present the work of others, it is important that individual objects get embedded in larger social situations. An understanding of a basic relationship between aesthetic production and ethical responsibility informs our work. Working with individuals who are creative in areas outside of art is paramount. The boundary between artistic and other practices is increasingly irrelevant to how we operate. Temporary Services started in a small storefront on the Northwest Side of Chicago in 1998. A year later operations were moved to an office in the center of the city. Currently, four people work under the name Temporary Services: Brett Bloom, Salem Collo-Julin, Marc Fischer, and Lora Lode. Our public project, Phood, took place near the former Phat Farm clothing store at 127 Prince Street, during September 2nd to 8th,, 2002. This address was previously the location of the artists' restaurant, Food. 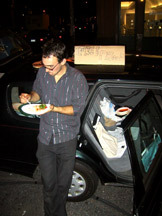 On each night of the project It Can Change parked an automobile at the site from 6 -8 pm. We distrubuted free phood, various publications and artworks concerning self-directed social activity and positive energy exchanges. We came to present our services in a location where such activities had been hinted at before using the mannerisms and techniques of the marginal past to suggest new possibilities for social interaction among contemporary inhabitants.